The fuel system is an electronic returnless on-demand design. The returnless fuelsystem reduces the internal temperature of the fuel tank by not returning hot fuelfrom the engine to the fuel tank. Reducing the internal temperature of the fuel tankresults in lower evaporative emissions. An electric turbine style fuel pump attaches to the fuel tank fuel pump module insidethe fuel tank. The fuel pump supplies fuel through the fuel feed pipe to the highpressure fuel pump. The high pressure fuel pump supplies fuel to a variable-pressurefuel rail. Fuel enters the combustion chamber through precision multi-hole fuel injectors.The high pressure fuel pump, fuel rail pressure, fuel injection timing, and injectiondurationare controlled by the engine control module (ECM). The electronic returnless fuel system is a microprocessor controlled fuel deliverysystem which transports fuel from the tank to the fuel rail. It functions as an electronicreplacement for a traditional, mechanical fuel pressure regulator. The pressure reliefregulator valve within the fuel tank provides an added measure of over-pressure protection.Desired fuel pressure is commanded by the engine control module (ECM), and transmittedto the fuel pump power control module via a GMLAN serial data message. A fuel pressuresensor located on the fuel feed pipe provides the feedback the ECM requires for ClosedLoop fuel pressure control. The fuel pump power control module is a serviceable GMLAN module. The fuel pump powercontrol module receives the desired fuel pressure message from the engine controlmodule (ECM) and controls the fuel pump located within the fuel tank to achieve thedesired fuel pressure. The fuel pump power control module sends a 25-kHz-PWM signalto the fuel pump, and pump speed is changed by varying the duty cycle of this signal.Maximumcurrent supplied to the fuel pump is 15-amps. A fuel pressure sensor located on thefuel feed pipe provides fuel pressure feedback to the ECM. The fuel pressure sensor is a serviceable 5-V, 3-pin device. It is located on thefuel feed pipe forward of the fuel tank, and receives power and ground from the ECMthrough a vehicle wiring harness. The sensor provides a fuel pressure signal to theECM, which is used to provide Closed Loop fuel pressure control. The flex fuel sensor measures the ethanol-gasoline ratio of the fuel being used ina flexible fuel vehicle. Flexible fuel vehicles can be operated with a blend of ethanoland gasoline, up to 85-percent ethanol. In order to adjust the ignition timing andthe fuel quantity to be injected, the engine management system requires informationabout the percentage of ethanol in the fuel. The flex fuel sensor uses quick-connect style fuel connections, an incoming fuel connection,and an outgoing fuel connection. All fuel passes through the flex fuel sensor beforecontinuing on to the fuel rail. The flex fuel sensor measures the fuel alcohol content,and sends an electrical signal to the engine control module (ECM) to indicate ethanolpercentage. The flex fuel sensor has a three-wire electrical harness connector. The three wiresprovide a ground circuit, a power source, and a signal output to the ECM. The powersource is battery positive voltage and the ground circuit connects to an engine ground.The signal circuit carries the ethanol percentage via a frequency signal. The flex fuel sensor uses a microprocessor inside the sensor to measure the ethanolpercentage and changes the output signal accordingly. The ECM provides an internalpull-up to 5-V on the signal circuit, and the flex fuel sensor pulls the 5-V to groundin pulses. The normal range of operating frequency is between 50 and 150-Hz, with50-Hz representing 0-percent ethanol, and 150-Hz representing100-percent ethanol. The microprocessor inside the sensor is capable of a certain amount of self-diagnosis.An output frequency between 180-Hz and 190-Hz indicates that the fuel is contaminated.Certain substances dissolved in the fuel can cause the fuel to be contaminated, raisingthe output frequency higher than the actual ethanol percentage should indicate. Examplesof these substances include water, sodium chloride (salt), and methanol. It should be noted that it is likely that the flex fuel sensor will indicate a slightlylower ethanol percentage than what is advertised at the fueling station. This is nota fault of the sensor. The reason has to do with government requirements for alcohol-basedmotor fuels. Government regulations require that alcohol intended for use as motorfuel be denatured. This means that 100-percent pure ethanol is first denatured withapproximately 4½-percent gasoline, before being mixed with anything else. When anethanol gasoline mixture is advertised as E85, the 85-percent ethanol was denaturedbefore being blended with gasoline, meaning an advertised E85 fuel contains only about81-percent ethanol. The flex fuel sensor measures the actual percentage of ethanolin the fuel. The fuel tank stores the fuel supply. The fuel tank is located in the rear of thevehicle. The fuel tank is held in place by 2-metal straps that attach to the underbodyof the vehicle. The fuel tank is molded from high-density polyethylene. The fuel fill pipe has a built-in restrictor in order to prevent refueling with leadedfuel. The fuel fill pipe has a tethered fuel filler cap. A torque-limiting device preventsthe cap from being over-tightened. To install the cap, turn the cap clockwise untilyou hear audible clicks. This indicates that the cap is correctly torqued and fullyseated. The electric turbine style fuel pump attaches to the fuel tank fuel pump module insidethe fuel tank and supplies fuel through the fuel feed pipe to the high pressure fuelpump. The fuel tank fuel pump module contains a reverse flow check valve. The checkvalve maintains fuel pressure in the fuel feed pipe in order to prevent long crankingtimes. The fuel level sensor consists of a float, a wire float arm, and a ceramic resistorcard. The position of the float arm indicates the fuel level. The fuel level sensorcontains a variable resistor which changes resistance in correspondence with the positionof the float arm. The fuel pump is mounted in the fuel tank fuel pump module reservoir. The fuel pumpis an electric turbine style pump which pumps fuel to the high pressure fuel pumpat a pressure that is based on feedback from the fuel feed pipe fuel pressure sensor.The fuel pump delivers a constant flow of fuel even during low fuel conditions andaggressive vehicle maneuvers. The fuel pump flex pipe acts to dampen the fuel pulsesand noise generatedby the fuel pump. The pressure relief regulator valve replaces the typical fuel pressure regulator usedon a mechanical returnless fuel system. The pressure relief regulator valve is closedduring normal vehicle operation. The pressure relief regulator valve is used to ventpressure during hot soaks and also functions as a fuel pressure regulator in the eventof the fuel pump power control module defaulting to 100-percent pulse width modulation(PWM) of the fuel pump. Due to variation in the fuel system pressures, the openingpressure for the pressure relief regulator valve is set higher than the pressure thatis used on a mechanical returnless fuel system pressure regulator. The fuel strainer attaches to the lower end of the fuel tank fuel pump module. Thefuel strainer is made of woven plastic. The functions of the fuel strainer are tofilter contaminants and to wick fuel. The fuel strainer normally requires no maintenance.Fuel stoppage at this point indicates that the fuel tank contains an abnormal amountof sediment or contamination. The fuel filter is located in the fuel tank fuel pump module. The paper filter elementtraps particles in the fuel that may damage the fuel injection system. The filterhousing is made to withstand maximum fuel system pressure, exposure to fuel additives,and changes in temperature. Nylon pipes are constructed to withstand maximum fuel system pressure, exposure tofuel additives, and changes in temperature. Heat resistant rubber hose or corrugated plastic conduit protect the sections of thepipes that are exposed to chafing, high temperature, or vibration. Nylon fuel pipes are somewhat flexible and can be formed around gradual turns underthe vehicle. However, if nylon fuel pipes are forced into sharp bends, the pipes maykink and restrict the fuel flow. Also, once exposed to fuel, nylon pipes may becomestiffer and are more likely to kink if bent too far. Take special care when workingon a vehicle with nylon fuel pipes. Quick-connect fittings provide a simplified means of installing and connecting fuelsystem components. The fittings consist of a unique female connector and a compatiblemale pipe end. O-rings, located inside the female connector, provide the fuel seal.Integral locking tabs inside the female connector hold the fittings together. The high fuel pressure necessary for direct injection is supplied by the high pressurefuel pump. The pump is mounted on the rear of the engine and is driven by a three-lobecam on the camshaft. This pump also regulates the fuel pressure using an actuatorin the form of an internal solenoid-controlled valve. In order to keep the enginerunning efficiently under all operating conditions, the engine control module (ECM)requests pressureranging from 2 to 15-MPa (290 to 2176-psi), depending on engine speed and load. Outputdrivers in the ECM provide the pump control circuit with a 12-V pulse-width modulated(PWM) signal, which regulates fuel pressure by closing and opening the control valveat specific times during pump strokes. This effectively regulates the portion of eachpump stroke that is delivered to the fuel rail. When the control solenoid is NOT powered,the pump operatesat maximum flow rate. In the event of pump control failure, the high pressure systemis protected by a relief valve in the pump. The fuel injection system is a high pressure, direct injection, returnless on-demanddesign. The fuel injectors are mounted in the cylinder head beneath the intake portsand spray fuel directly into the combustion chamber. 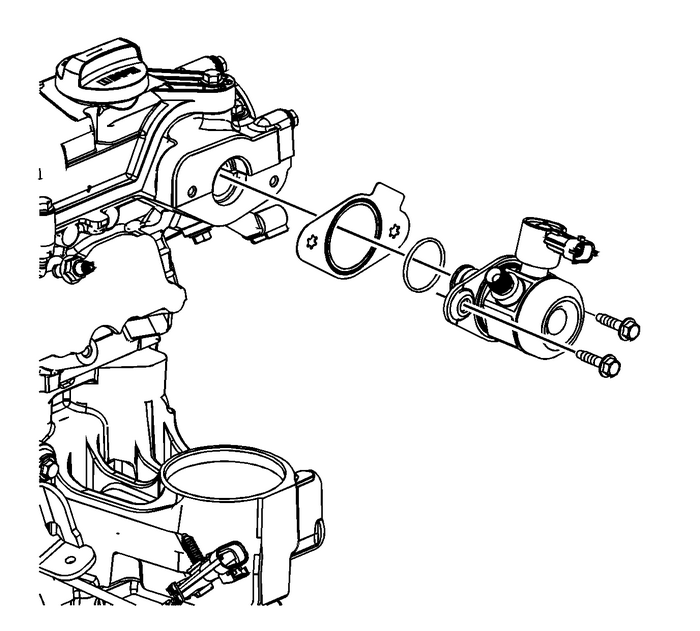 Direct injection requires highfuel pressure due to the fuel injector's location in the combustion chamber. Fuelpressure must be higher than compression pressure requiring a high pressure fuel pump.The fuel injectorsalso require more electrical power due to the high fuel pressure. The ECM suppliesa high voltage supply circuit and a high voltage control circuit for each fuel injector.The injector high voltage supply circuit and the high voltage control circuit areboth controlled by the ECM. The ECM energizes each fuel injector by grounding thecontrol circuit. The ECM controls each fuel injector with 65-V. This is controlledby a boost capacitorin the ECM. During the 65-V boost phase, the capacitor is discharged through an injector,allowing for initial injector opening. The injector is then held open with 12-V. The fuel injector assembly is an inside opening electrical magnetic injector. Theinjector has six precision machined holes that generate a cone shaped oval spray pattern.The fuel injector has a slim extended tip in order to allow a sufficient cooling jacketin the cylinder head. The fuel rail pressure sensor detects fuel pressure within the fuel rail. The enginecontrol module (ECM) provides a 5-V reference voltage on the 5-V reference circuitand ground on the reference ground circuit. The ECM receives a varying signal voltageon the signal circuit. The ECM monitors the voltage on the fuel rail pressure sensorcircuits. When the fuel pressure is high, the signal voltage is high. When the fuelpressureis low, the signal voltage is low. The fuel pulse dampener is a part of the low pressure fuel feed pipe assembly. Thefuel pulse dampener is diaphragm-operated, with fuel pump pressure on one side andwith spring pressure on the other side. The function of the dampener is to dampenthe fuel pump pressure pulsations. The ECM monitors voltages from several sensors in order to determine how much fuelto give the engine. The ECM controls the amount of fuel delivered to the engine bychanging the fuel injector pulse width. The fuel is delivered under one of severalmodes. The ECM supplies voltage to the fuel pump power control module when the ECM detectsthat the ignition is ON. The voltage from the ECM to the fuel pump power control moduleremains active for 2-s, unless the engine is in Crank or Run. While this voltage isbeing received, the fuel pump power control module closes the ground switch of thefuel tank fuel pump module and also supplies a varying voltage to the fuel tank fuelpump modulein order to maintain the desired fuel line pressure. The ECM calculates the air/fuelratio based on inputs from the engine coolant temperature (ECT), manifold absolutepressure (MAP), mass air flow (MAF), and throttle position sensors. The system staysin starting mode until the engine speed reaches a predetermined RPM. During a cold start, the ECM commands dual-pulse mode during Open Loop operation toimprove cold start emissions. In dual-pulse mode, the injectors are energized twiceduring each injection event. If the engine floods, the engine can be cleared by pressing the accelerator pedaldown to the floor and then cranking the engine. When the throttle position sensoris at wide open throttle (WOT), the ECM reduces the fuel injector pulse width in orderto increase the air to fuel ratio. The ECM holds this injector rate as long as thethrottle stays wide open and the engine speed is below a predetermined RPM. If thethrottle is not heldwide open, the ECM returns to the starting mode. The HO2S has varying voltage output, showing that the HO2S is hot enough to operateproperly.The ECT sensor is above a specified temperature.A specific amount of time has elapsed after starting the engine. Specific values for the above conditions exist for each different engine, and arestored in the electrically erasable programmable read-only memory (EEPROM). The systembegins Closed Loop operation after reaching these values. In Closed Loop, the ECMcalculates the air/fuel ratio, injector ON time, based upon the signal from varioussensors, but mainly from the HO2S. This allows the air/fuel ratio to stay very closeto 14.7:1. When the driver pushes on the accelerator pedal, air flow into the cylinders increasesrapidly. To prevent possible hesitation, the ECM increases the pulse width to theinjectors to provide extra fuel during acceleration. This is also known as power enrichment.The ECM determines the amount of fuel required based upon throttle position, enginecoolant temperature (ECT), manifold absolute pressure (MAP), mass air flow (MAF),and enginespeed. When the driver releases the accelerator pedal, air flow into the engine is reduced.The ECM monitors the corresponding changes in throttle position, mass air flow (MAF),and manifold absolute pressure (MAP). The ECM shuts OFF fuel completely if the decelerationis very rapid, or for long periods, such as long, closed-throttle coast-down. Thefuel shuts OFF in order to prevent damage to the catalytic converters. The ECM controls the air/fuel metering system in order to provide the best possiblecombination of driveability, fuel economy, and emission control. The ECM monitorsthe heated oxygen sensor (HO2S) signal voltage while in Closed Loop and regulatesthe fuel delivery by adjusting the pulse width of the injectors based on this signal.The ideal fuel trim values are around 0-percent for both short and long term fueltrim. A positivefuel trim value indicates the ECM is adding fuel in order to compensate for a leancondition by increasing the pulse width. A negative fuel trim value indicates thatthe ECM is reducing the amount of fuel in order to compensate for a rich conditionby decreasing the pulse width. A change made to the fuel delivery changes the longand short term fuel trim values. The short term fuel trim values change rapidly inresponse to the HO2S signal voltage.These changes fine tune the engine fueling. The long term fuel trim makes coarse adjustmentsto fueling in order to re-center and restore control to short term fuel trim. A scantool can be used to monitor the short and long term fuel trim values. The long termfuel trim diagnostic is based on an average of several of the long term speed loadlearn cells. The ECM selects the cells based on the engine speed and engine load.If the ECM detectsan excessively lean or rich condition, the ECM will set a fuel trim diagnostic troublecode (DTC).